Almost April. Time for an update on the goings on at your Community Hall. First and foremost, a big thank you to all of you who responded to our plea to help raise funds for our “Raise the Roof” campaign – $20,000 matching funds for the $40,000 or so that we need to replace the aging flat roof over the Hall. Donations have been coming in steadily – though a great deal more is needed before we can go ahead. The fund-raiser for the Skate-Board Park took place on April 19th and was a great success. I took my camera to take some pictures for this newsletter, but when I got home, I found none of them were usable! Clearly, not one of my talents! 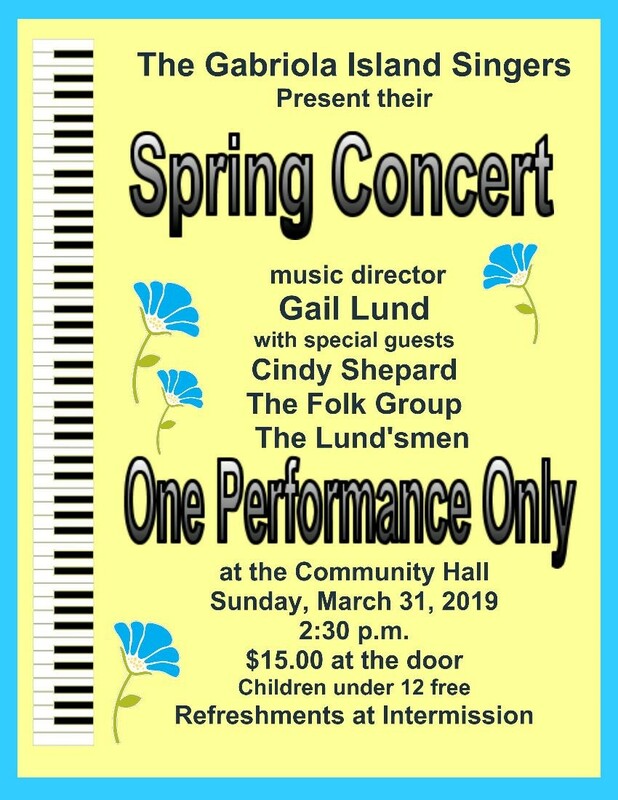 The Gabriola Singers will hold another of their fabulous concerts on Sunday March 31st at 2:30pm. 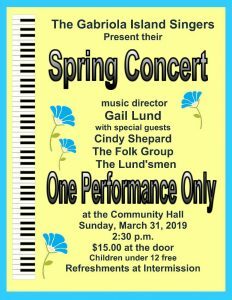 One performance only. See the attached poster (click graphic to embiggen). At our March meeting. the Board approved a document outlining the responsibilities of Board members – a useful guideline not only for those of us who are current board members, but also helpful as we attempt to recruit new blood. At the same meeting we covered a lot of other ground. Among the topics was whether we might be able to save ourselves some overhead costs by using volunteers more extensively. Already one of our Board members has volunteered to take the provincial WaterSafe Course (compulsory for buildings such as the Hall). It is offered through Thomson-Rivers University in Kamloops but can be done on-line. At the present time our maintenance person, Mike Pelzer, does it on a volunteer basis (thanks, Mike) but having a second qualified person would be useful. Our gratitude, Alex Dewar, for taking this on. On April 24th the Hall is excited to host a workshop for other community organisations entitled “SPONSORSHIP – HOW DO I RAISE MORE MONEY FOR MY ORGANIZATION?”. The speaker will be Brent Barootes, President & CEO of the Partnership Group – Sponsorship Specialists. The sponsorship environment is rapidly changing and we are happy to share the opportunity of finding out how to be more effective in securing sponsorship funding with other island non-profits. We re-keyed the Hall this month with the objective of keeping better track of who has access. Yet another board member, Erik Johnson, turned out to be a lock expert and accomplished the job very effectively. Erik also assisted in making some necessary repairs in the kitchen. Thanks yet again! So, I’ll end with two rounds of applause. One to the generous donors (you) who are helping us put together funding for the failing flat roof. And another to all our volunteers, starting with our board members. I discovered a quotation the other day from a well-known Muslim teacher from California. I liked it: “Volunteering is the ultimate exercise in democracy. You vote in elections once a year, but when you volunteer, you vote every day about the kind of community you want to live in” (Dr Syed Muhammad Almashadi).